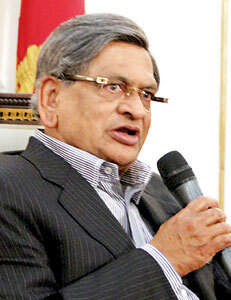 On Friday India's External Affairs Minister S.M Krishna concluded his second visit to Sri Lanka in fourteen months. Behind the ceremonial events of handing over houses, bicycles, medical equipment, railway lines etc and signing numerous bilateral agreements, lay weightier purposes of nudging Sri Lanka towards a political settlement with minority Tamils, as part of the reconciliation process following decades of conflict. No doubt there was also the objective of reinforcing goodwill with its small but important neighbour. In a January 1st interview with India's "Business Standard" on the subject of external relations, Krishna reiterated the strategic importance of Sri Lanka to India. "Security wise, we are dependent on Sri Lanka - there are large security concerns that can affect both countries in the Indian Ocean. We would like to continue to keep on the right side of Sri Lanka." he said. As expected during his visit Krishna made reference to moving towards "a political settlement based on the full implementation of the 13th Amendment to the Sri Lankan Constitution," which is the route favoured by New Delhi and which, he reminded, "the Government of Sri Lanka has on many occasions conveyed to us its commitment to move towards." What is conspicuous though, as noted by analysts (including the JVP) is that this declaration of the government's intent was not mentioned in Sri Lankan External Affairs Minister G. L. Pieris's statement at the joint press briefing held in Colombo on Tuesday. That statement mainly referred to the deep-rooted ties between the countries and reaffirmed their cordial relations. Krishna, who met President Mahinda Rajapaksa earlier that day told journalists: "The President assured me that he stands by his commitment to pursuing the 13th Amendment plus approach." A subtle modification in terminology may be noted here in that the reference is to the "13th Amendment plus APPROACH" (emphasis added). It is not clear whether this was the exact phrase used by Rajapaksa, or Krishna's way of expressing the outcome of his talks with the president. Either way, it would seem to admit the need for some flexibility in the negotiations, and that nothing is carved in stone. At the time of Krishna's arrival the government's talks with the Tamil National Alliance (TNA), launched with a view to arriving at a political solution, appeared to be deadlocked. This was over the TNA's demand to seek agreement on substantive issues before participating in the Parliamentary Select Committee mooted by the government. Media reports indicate that Krishna in his meeting with representatives of the TNA had urged them to participate in the PSC. It remains to be seen whether Krishna's mediation effort will yield results. Commenting on the visit "The Hindu" in an editorial Friday urged President Rajapaksa to "move forward towards the specifics." "Thus far, there has been articulation only about those subjects the government is unwilling to devolve, that is, police powers and land administration," it said. Referring to the Parliamentary Select Committee, it asked the TNA not to shy away or "be discouraged by extremist elements in the community - from playing a constructive role in this process." It asked the government to hold early provincial elections in the North. It should be said that the formation of the PSC seems to be consistent with government's approach to reconciliation as sketched at the outset, soon after the war ended. The two items considered to be expressions of government policy were, a statement by a high powered Indian delegation that visited on May 20-21, 2009, and Rajapaksa's joint statement with UN Secretary General Ban ki Moon dated May 23, 2009. Both these statements use identical language in referring to the intention of the government to "begin a broader dialogue with all parties, including the Tamil parties in their new circumstances" to advance the process of peace and reconciliation. The phrase "Tamil parties in their new circumstances" is clearly a diplomatic way of referring to the TNA, the one-time proxies of the defeated LTTE. The PSC may be seen as a mechanism for the "broader dialogue with all parties" referred to in the two policy statements. Such a dialogue would presumably create the space not just for the TNA but also for representatives of the Muslims and opposition parties to make themselves heard. It is argued that such an inclusive approach would be more likely to produce a solution that can be implemented, since it would have wider acceptance. There would seem to be merit in this approach, both on the basis of being fair by all concerned, and also the need to be pragmatic. There is no point in arriving at a solution on paper that cannot be implemented because it gets shot down by nationalist-minded extremists on one side or other. There is an onus on the government to carry the nationalist sections within its ruling coalition along with it, in the process of negotiation. Cabinet spokesman Keheliya Rambukwella on the date of Krishna's departure said the government was very clear on what was up for discussion. This was, power sharing and the 13th Amendment. He said the government could not agree to conditions before discussions, as the TNA insisted. For its part the government has, in the wake of Krishna's visit, proposed the formation of a second chamber (Senate) with a view to improving relations between the centre and provinces. It may be also be noteworthy that the Attorney General (also on the date of Krishna's departure) is reported to have withdrawn a controversial Land Circular that required the registration of land by people of the Northern and Eastern provinces. A writ petition had been filed by TNA parliamentarian M. A Sumanthiran challenging this circular. It is significant that Krishna hailed the "many constructive recommendations" of the Report of the Lessons Learnt and Reconciliation Commission (LLRC) which, he said, if implemented would "mark a major step forward in the process of genuine national reconciliation." The TNA has trashed the report out of hand. The support demonstrated by India for Sri Lanka's home-grown political solution and reconciliation process will be of vital importance in the months ahead, when the UN Human Rights Council begins its sessions in Geneva, and it is expected that the 'war crimes lobby' will resume its vendetta. What veritable fairy tales are these?